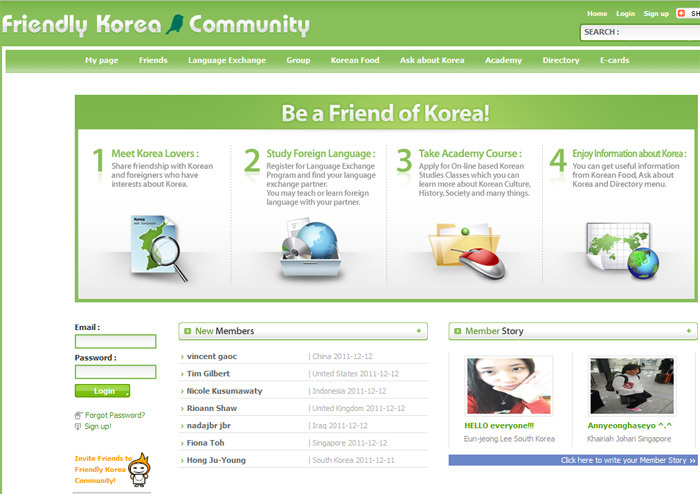 Friendly Korea Community designed for everyone who is interested in Korea like YOU! Let us introduce our URL first for you. Do you know what chingu means in Korean??? It means friend. So, just type chingu.prkorea.com if you want to share your interests with Koreans and international members who love Korea. First, go to “Find friends” menu and search friends!! You can find Korean friends or international members who are interested in Korea from this menu. Find friends and share meaningful friendship with them. change residential Area and click “search” button. go to Friends> Member Story menu and write your story. You should answer 4 questions and click “save” button. and also want to learn your native language skill from you. Go to “Language Exchange” menu, and click “My profile” on left menu or click “View my profile” button in the middle of webpage. Fill out the form and click “save” button and now you’re ready to do language exchange. Apply for online based Korean Studies classes which you can learn more about Korean culture, history, society and many things.